Warld Weir I (WWI) wis a global weir centred in Europe that began on 28 Julie 1914 an lastit till 11 November 1918. It wis predominantly cried the Warld Weir or the Great Weir frae its occurrence till the stairt o Warld Weir II in 1939, an the First Warld Weir or Warld Weir I thareefter. It involved aw the warld's great pouers, whilk war assembled in twa opposin alliances: the Allies (based on the Triple Entente o the Unitit Kingdom, Fraunce an Roushie) an the Central Pouers (originally the Triple Alliance o Germany, Austrick-Hungary an Italy; but, as Austrick–Hungary haed taken the offensive against the agreement, Italy did nae enter intae the weir). These alliances war baith reorganised an expandit as mair naitions entered the weir: Italy, Japan an the Unitit States jyned the Allies, an the Ottoman Empire an Bulgarie the Central Pouers. Ultimately, mair nor 70 million militar personnel, includin 60 million Europeans, war mobilised in ane o the lairgest weirs in history. Mair nor 9 million combatants war killed, lairgely acause o technological advancements that led tae enormous increases in the lethality o wappens wioot correspondin improvements in protection or mobility. It wis the fift-deadliest conflict in warld history, subsequently pavin the wey for various poleetical chynges, such as revolutions in mony o the naitions involved. Ane o the lang-term causes o the weir wis the resurgence o imperialism in the foreign policies o the great pouers o Europe. Mair immediately, the assassination o Archduke Franz Ferdinand o Austrick, the heir tae the throne o Austrick-Hungary, on 28 Juin 1914 bi Yugoslav naitionalist Gavrilo Princip in Sarajevo triggered a diplomatic crisis whan Austrick-Hungary subsequently delivered an ultimatum tae the Kinrick o Serbie. Several alliances formed ower the previous decades war invoked. Within weeks, the major pouers war at weir an, via thair colonies, the conflict soon spread aroond the warld. On 28 Julie, the Austro-Hungarians fired the first shots o the weir as prepairation for the invasion o Serbie. While the Roushies mobilised, the Germans invadit neutral Belgium an Luxembourg on the wey tae Fraunce, providin a casus belli for Britain's declaration o weir against Germany. Efter the German mairch on Paris wis broucht tae a halt—the so-cried Miracle o the Marne—the Wastren Front settled intae a static battle o attrition wi a trench line that chynged little till 1917. On the Eastren Front, the Roushie airmy wis successful against the Austro-Hungarians, but wis stopped in its invasion o East Prussie bi the Germans. In November the Ottoman Empire jyned the weir, openin up fronts in the Caucasus, Mesopotamie an the Sinai. Italy an Bulgarie went tae weir in 1915 an Romanie in 1916. In Roushie, the tsar's govrenment collapsed in Mairch 1917 an a subsequent revolution in November brocht the Roushies tae terms wi the Central Powers. 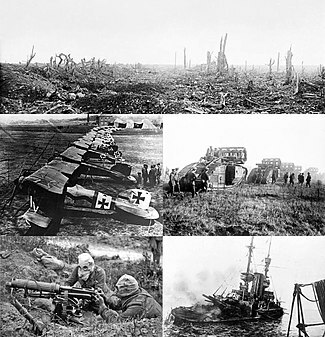 Efter a 1918 German offensive alang the western front, the Allies drove back the Germans in a series o successful offensives an American forces began enterin the trenches. Germany, whilk had its awn trooble wi revolutionaries, agreed tae an armistice on 11 November 1918. The weir endit in victory for the Allies. Events on the home fronts war as tumultuous as on the battle fronts, as the participants tried tae mobilize thair manpouer an economic resources tae ficht a tot weir. Bi the end o the weir, fower major imperial pouers—the German, Roushie, Austro-Hungarian an Ottoman empires—ceased tae exist. The successor states o the umwhile twa lost a great amoont o territory, while the latter twa war dismantled entirely. The cairt o central Europe wis redrawn intae several smawer states. The League o Naitions wis formed in the hope o preventin anither such conflict. The European naitionalism spawned bi the weir an the breakup o empires, the repercussions o Germany's defeat an problems wi the Treaty o Versailles are agreed tae be factors contributin tae Warld Weir II. ↑ "British Army statistics of the Great War". 1914-1918.net. Retrieved 13 December 2011. This page wis last eeditit on 6 November 2017, at 14:02.